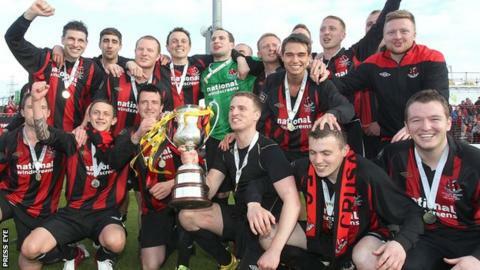 Crusaders will face Sligo Rovers in the stand-out tie in the opening round of the 2014 Setanta Sports Cup. The Crues won the competition in 2012 and they will be facing the current FAI Cup holders and last year's League of Ireland champions. Glentoran will meet holders Shamrock Rovers, with Coleraine facing Dundalk and debutants Ballinamallard against League of Ireland winners St Pat's. Cliftonville and Linfield have decided not to enter the 2014 competition. Linfield, inaugural winners in 2005, said reduced prize money and scheduling of matches led to their decision. Current Premiership champions Cliftonville said their busy fixture list had prompted their withdrawal. The loss of two leading teams from Northern Ireland's top flight, has led to speculation about the long-term future of the cross-border competition. However on Monday it was announced that Setanta Sports were renewing their sponsorship for a further three years to 2016. The year's competition winners will earn just short of £28,000 which is well down on the £120,000 picked up by inaugural winners Linfield in 2005. Shamrock Rovers earned close to £45,000 for winning this year's competition. In the eight years of the Setanta Cup, Linfield and Crusaders are the only Irish League clubs to have won the trophy. In the 2013 final, Shamrock Rovers beat Drogheda United 7-1. First legs are scheduled to take place on Monday 24 February with the return games on Monday 10 March.